Staff turnover in the call center industry costs the UK £1billion per year. This highlights the vital importance of training, motivating and retaining good staff for any business with customer care centers. In Brazil, with so many call centers staffed by students who see the job as temporary work before graduating and “getting a real job”, the challenge is not only staff retention but how to motivate and maintain high-quality service delivery. 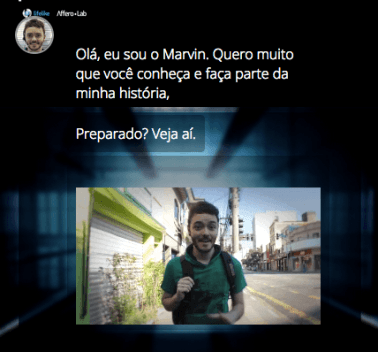 Working with Lifelike Learning in Brazil, we implemented a new type of call centre training experience designed not only to train but to demonstrate that the skills gained are transferable to life. This is a 3-day classroom experience in which trainees must work alongside and assist synthetic (ie. automated) characters. Central to the scenario is the notion that an epidemic is transforming poorly performing call centre agents into robots. 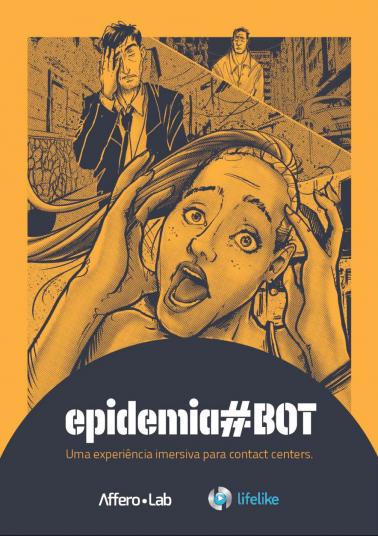 Hence the experience name, Epidemia#Bot. The adaptive experience is divided into 9 chapters with each chapter dealing with an aspect of call center training and sees the plot ratchet up! Trainees talk to the automated characters through our responsive Communicator web application and use a special “portal” to access PDFs and videos which are unlocked based on decisions made by the trainee and by a moderator “pushing” the content to advance the scenario. Throughout the experience, characters present trainees with a range of challenges and question types: multiple choice, decisions, situational judgment tests, and qualitative open reply questions. Plus some questions are timed to evaluate attention and awareness. Every trainee interaction is collected in real-time so that a moderator can live-track trainee answers. Every answer is also converted into a real-time assessment such that individual trainee performance can be seen in comparison to the cohort.